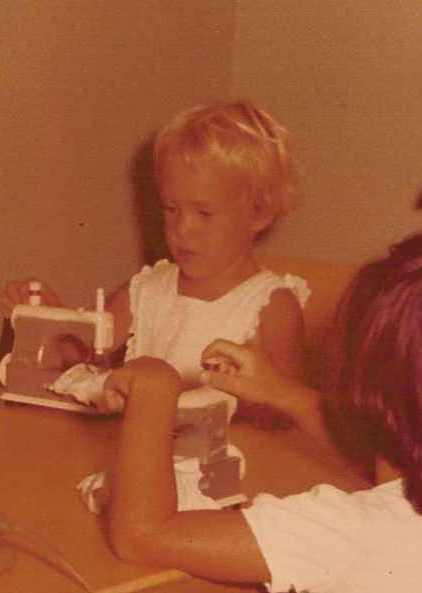 My interest in needlework has been influenced by a number of events, the first of which was my introduction to sewing at age 4 when I received my first sewing machine - a child's Necchi which sewed a type of chain-stitch seam. My mother was an excellent seamstress and knitter, but was not accomplished nor interested in other needlework techniques. I continued sewing, and began teaching myself other techniques by following the directions and pictures in my Good Housekeeping Needlecraft Encyclopedia. In the mid-70s I saw a photo of a Bargello book and taught myself how to do needlepoint, but in the early 80s my interest in needlework changed drastically after seeing my first EGA exhibit in Atlanta. It was hard to believe such beautiful things could be accomplished with a needle and thread, so I vowed to learn as much as I could and began taking classes in every technique I could find. In the late 80s, I took my first sampler class, and in 1991 designed a commemorative sampler for my grandmother's 100th birthday. That same year I also saw my first English band sampler, and was completely transformed. I continued working with a number of embroidery techniques for a few more years, but from that point on my heart and passion belonged to samplers and embroideries from the 16th to 19th centuries. In 1995, I acquired my first antique sampler. It wasn't the English band sampler I thought would be my "one and only" antique sampler, but it seemed to be meant for me. I resisted buying it the first two times I saw it, but when it showed up a third time I decided it had to have a home with me. I was intrigued by the design and the maker (Laura Ann Ludington), and began researching her story. Thus began my journey of collecting antique needlework and studying the genealogy of the makers. This path has taken me many places, including wandering in graveyards at dusk with foxes. The stories of "my girls" will be part of the reproductions I create. I hope you find them enjoyable.